The development of Crook, 1851-1901: using the census. The Census is basically a headcount of everyone living in the country on a particular night. The first census in England and Wales was taken in 1801 and there has been one every 10 years since (apart from in 1941 when British involvement in the Second World War prevented it taking place). Between 1801 and 1831 only general information was collected but from 1841 details about each person were recorded. This makes the Census a wonderful source of information for historians. We have extracted some information from the Census returns of 1851 and 1901 for Crook, which will help you discover how and why Crook and Willington developed in the latter half of the nineteenth century. Take a look at the sources and see what you can find out. The information collected on the Census is obviously personal in nature and, as a result, the returns themselves can only be seen 100 years after the Census was taken. This means that only material from the Censuses between 1841 and 1901 is currently available. The national set of census returns for England, Wales and the Channel Islands are held at the Family Records Centre in Islington, London. However, the returns for the Censuses between 1871 and 1901 can also be seen online via the National Archives website (this is a charged service). 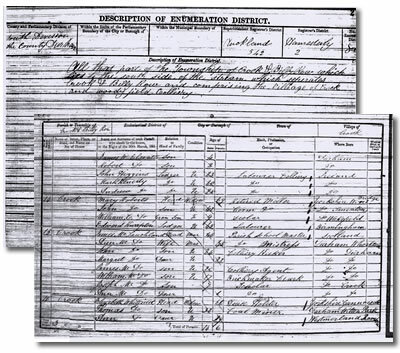 Many local record offices and libraries hold copies of the Census returns for their own area, which have often been indexed by local history and family history societies. 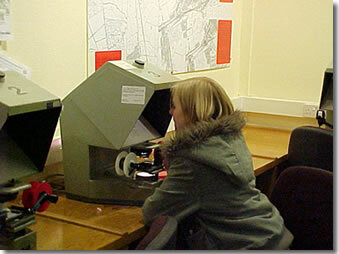 The Census returns for County Durham are held by Durham County Record Office.